The following article arranged and edited specifically for On Target Publications, is adapted from the newly released book, REAL Movement: Perspective on Integrated Motion & Motor Control. It’s designed as a stand-alone article that can help improve the way in which people move. However it’s content will be fully grasped with the additional resources of the book and accompanying video, Improving Fascial Highways: Perspective on Integrated Motion & Motor Control. There is one ocean, not seven. The concept of seven oceans is a man-made construct, just as the concept of isolated muscles is man-made. It is possible to dissect out individual muscles and classify them into isolated groups that work separately to produce forces through a concentric shortening. But, in reality, our nervous system regulates and controls forces while tissues lengthen to control gravity, ground reaction forces, mass, momentum and other forces presented. An integrated approach strives to incorporate multiple joints and planes into a movement in order to functionally stretch the abdominals. It is important that hip flexors be lengthened with the abdominals. Hip flexor flexibility adds to the motion of the abdominals and torso extension in the sagittal plane. When dynamic extension actions occur (which happens during gait) the abdominals and hip flexors must be able to accommodate adequate excursion to perform optimally. The traditional lens through which to view muscles, is one of isolation, where the shortening motion is described as the muscle action, and each muscle has a beginning and an end. For example, isolation describes the quadriceps muscle, located in the thigh, as a knee straightener, with the origin (beginning) being the top of the femur and the insertion (end) being the patellar tendon into the tibia. When these two points are brought together, the knee will straighten. Yet this is exactly the opposite of what the quadriceps do when working with other muscles and tissue to control the body as it reacts to the forces continuously presented to it, including gravity, ground forces, mass and momentum. This integrated mindset of tissue controlling forces in order to remain upright and effectively move throughout the day allows a different lens in which to look at muscle action. Through this lens, it’s seen that the muscles on the front of the thigh, that we call the quadriceps, in conjunction with other muscles, lengthens to control the knee from bending, rather than straightening the knee. When necessary, muscles CAN produce forces in order to create a motion; however, acting upon anything requires a great deal of energy compared to REACTING to the environment in an integrated way that allows proper and efficient control. The concept of interrelated and interconnected tissues that work together to control the body allows a better understanding of the true nature of the body. Pioneers in the world of movement, fascia and the intersection of the nervous system, include Robert Schleip, Ida Rolf (developer of Structural Integration),Thomas Myers, and the Stecco family (developers of Fascial Manipulation). 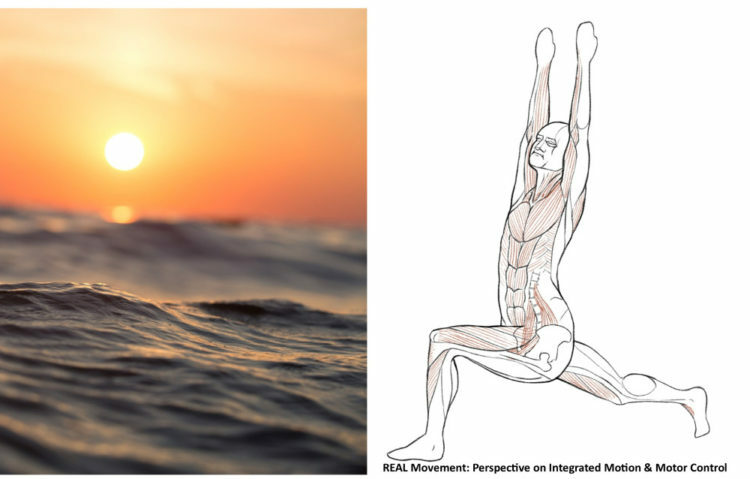 Other contributors to how the neurological system integrates with the fascial system include Robert Carrick, Vladimir Janda, and George Goodheart, while in the movement world, pioneers such as Moshe Feldenkrais, Gary Gray, and renowned yogi Krishnamacharya, his son DKT Desikichar and nephew BKS Iyengar are just a few who have contributed to my understanding of the interconnectedness of the body. Although each discipline is unique and different from the other, commonalities can be found between disciplines that demonstrate how the body is connected from top-to-bottom, inside-to-out, and in mind, body, and spirit. The following is the definition of integrated motion that I like best: motion needs to be a synchronous dissociation of body parts. If two bones move at the same speed in the same direction, the joint, defined as space between bones, doesn’t feel any motion. Bones move, joints feel and muscles react to movement, which means that if movement is asynchronous there is going to be compensation in the system. Dr. David Tiberio, PT, Ph.D., describes injury as often occurring according to the Goldilocks principle, meaning too much motion, not enough motion or motion at the wrong time. Most often, injury occurs when forces are presented that the body can’t handle (unless it’s a crush injury.) Injury typically occurs when the body should transition the force load into the unload/utilization of forces, a point in time the Gray Institute calls the Transformational Zone (TZ). Within this paradigm, the quadriceps will control sagittal plane knee flexion while also controlling frontal and transverse plane motion. This is opposite of the isolated action taught in books, where the quad creates knee extension. While muscles CAN create force, they’re more efficient and effective while controlling and reacting to the external forces presented to them by taking advantage of the internal tensile forces that are transmitted from one part to another. Within this framework, it’s also more challenging to comprehend that when the foot hits the ground at the first TZ of gait, the quadriceps control frontal plane abduction and transverse plane internal rotation in addition to flexion, along with tissue above and below the knee. The concept of tissue lengthening first in order to control gravity, ground reaction, mass and momentum fits into other systems and enhances the mindset and paradigm of treatment options within any given practice. Injury typically occurs at the TZ, and if the Transformational Zone for a particular activity is known, then we should assess to see if the joint can feel (or perceive) the correct triplane motion. If the joint isn’t feeling a specific motion in a specific plane, then this paradigm lets the question of “WHY?” be asked and answered logically and effectively. In order to create an environment unique to the patient, it is paramount to have a thorough understanding of the specific movements unique to that INDIVIDUAL. If we know what they want to accomplish, a 3D movement assessment that replicates the specific task can be performed in order to see if what should happen, does happen, while specifically analyzing at the Transformational Zones (TZ). As mentioned previously, at the first Transformational Zone (TZ), the hip should feel flexion, adduction, and internal rotation. This motion is important for maximizing gluteus complex function, therefore, assessment is paramount, because limitation can easily lead to compensation somewhere along the kinetic chain. 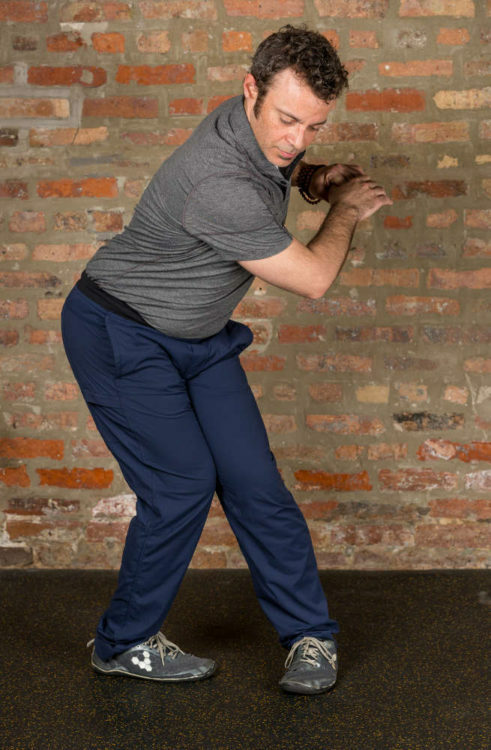 One effective strategy in assessing the hips at a specific TZ is through triplane lunging. The Gray Institute describes six pure plane vectors in movement, specifically anterior and posterior in the sagittal plane, same-side and opposite-side lateral in the frontal plane, and same-side and opposite-side rotational in the transverse plane. Lunges can be performed in each of these planes, and a common lunge matrix is described as an anterior lunge, same-side side lunge, and same-side rotational lunge, while an uncommon lunge is defined as a posterior lunge, opposite-side side lunge, and opposite-side rotational lunge. 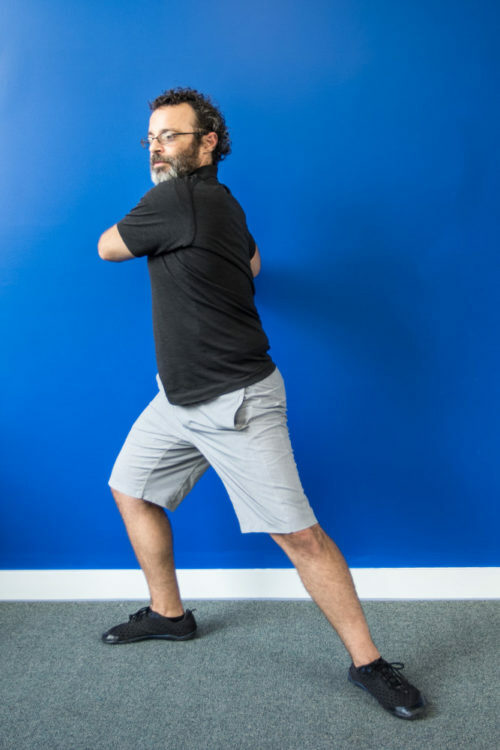 Clinical Pearl: In order to access the anterior tissue of the body, I often utilize common lunges, and to access the posterior tissue, I use uncommon lunges. However, any lunge with a specific reach can target the emphasis of tissue load into any body part. 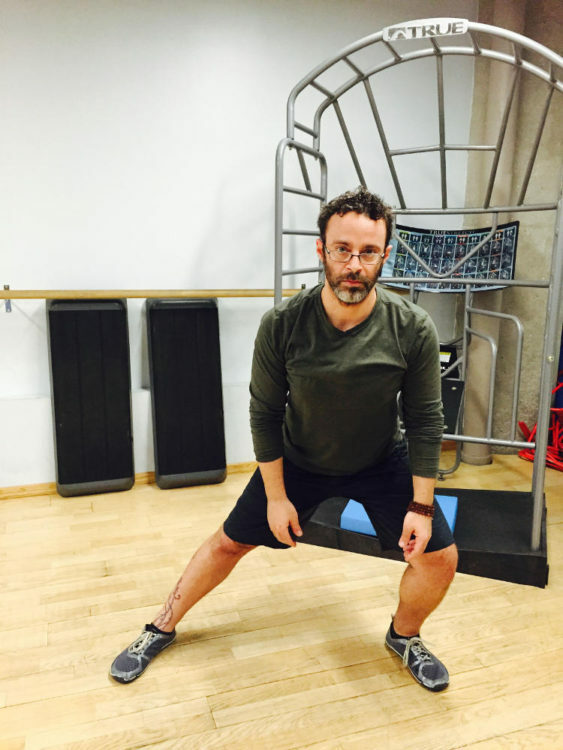 A lunge is simply an exaggerated step, and should be performed with synchrony, rhythm and fluidity. When movement transitions from an eccentric lengthening to a concentric shortening, it should look like a spring, rather than a shock wave. A shockwave is indicative of compensation somewhere in the system, and means there is no synchronous dissociation along the kinetic chain. Your job then, becomes to figure out where it is limited. For example, the stepping foot in an anterior common lunge should feel the triplane hip motion of flexion, adduction and internal rotation, comparable to the front foot in gait. The hip, however, will feel the most flexion, compared to adduction and internal rotation because the movement is in the sagittal plane. Similarly, when a common frontal plane lunge is performed, if done correctly, the dominant triplane motion for the first TZ is adduction because the motion is lateral. The reason for the inability to perform a proper frontal plane lunge will vary. Sometimes it’s not in their “movement vocabulary,” and once learned is easily to achieve. Other times, this motion is more difficult for people, in which case having a better idea of how the foot, especially the midfoot, and hip are working can be the key to understanding why there is difficulty. Specifically understanding if the midfoot can achieve dorsiflexion, abduction and inversion, which are the relative motions felt in the midtarsal joints at the first TZ. Often, the foot will be in a position (i.e. flat or internally rotated) and not able to go through motions that allow a sequential dissociation of the system. Other times the midfoot will have too much motion, which comes with its own similar set of potential issues. Therefore, knowing what should happen and understanding what is actually happening is essential. A proper frontal plane lunge often difficult to learn, particularly if the movement is new. Often times, I start with a sagittal and transverse lunge, because in my opinion, they’re easier to teach versus frontal plane lunges. The inability to translate the pelvis laterally outside the knee and foot at the first TZ are some of the difficulties people have when attempting this motion. Often, the pelvis never translates outside of the knee and foot, and therefore the hip feels flexion, ABduction and external rotation (instead of flexion, ADDuction and internal rotation). 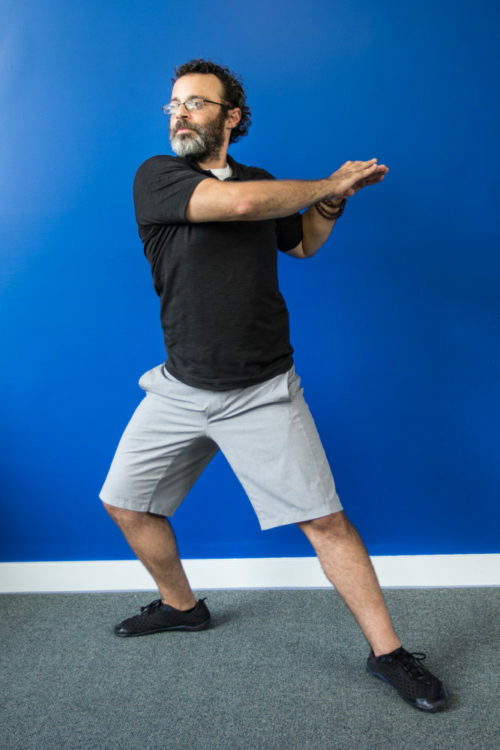 In this lunge, the hip is flexed, abducted and externally rotated, rather than flexed, adducted and internally rotated, which is the triplane motion experienced at the first TZ of gait. I’ve found that taking the time to teach the various components necessary for a frontal plane lunge, including translation and dissociation of the pelvis and foot placement can be beneficial and often challenging. Early in my career, I’d attempt to teach this rather innocuous, but challenging, movement in the first session, however I’ve learned to start with success (i.e. what a client does well) rather than immediately hammer the minutiae of a specific movement they aren’t good at. Therefore, if one isn’t initially successful with a frontal plane lunge, the frustration of the attempts can easily lead to a sympathetic dominant response, something that should be avoided at all costs. My immediate goal is to stimulate parasympathetic nervous system response and downregulate the body, which is a reason why starting with success is so logical. A frustrating initial experience can set the wrong tone for future sessions. Mindset and self-talk are vital to the creation of the feedforward mechanisms that are required to learn new behaviors. Too much motion at one joint means not enough motion above or below. Another way to look at the too much, not enough scenario: too much motion in one plane of motion can be the result of not enough motion in another plane. Knowledge of a joint that is too mobile or too stable is also important. In the case of the lunge, what plane of motion is the hip joint restricted in? I typically assess this in a number of ways, including an off-weight bearing “quadrant test” to assess closing angle restrictions in the hip. My experience is that the hip will be limited into adduction, especially with a flexed hip, but it isn’t consistent so don’t assume! In addition, as mentioned, closing angle pinch in the hip (or any joint) is indicative of capsular restriction and the immediate plan needs to be to focus on increasing pinch free range, which will often coincide with less pain, greater ROM and more function. If there is a compressed joint (in this case the hip), understanding how the joint responds to compression and distraction is important in directing the course of treatment. For example, upon muscle testing, sometimes distraction will allow the muscles surrounding the joint to achieve a stronger contraction, while compression would show the opposite. Other times, compression of the joint will increase the muscle’s ability to contract, while distraction would show the opposite. A joint that responds to distraction will get distracted as part of the work/homework, while a hip that responds to compression should focus on joint mobility without distraction and the strengthening the muscles around the joint as much as possible. I believe that if a joint that is compressed (indicated by closing angle pinch) and responds to compression, the body is seeking stability and doing so through compression to compensate for hypermobility above or below. When teaching any movement, my verbal cues often involve the concept of translating versus tilting. It’s possible to tilt the pelvis without translating it, but it’s virtually impossible to translate the pelvis without tilting. With this concept in mind, when someone has difficulty translating their hips during a stretch and instead wants to tilt, I wonder if the limitation is in the fascial chain, a restricted joint or simply a movement that isn’t in their ‘vocabulary’ yet. It’s your job as a detective to find out. The cue “the pelvis should move further and faster than the shoulders” has been an effective way to create the sequential dissociation necessary for efficient movement. Recall that if two bones move in the same speed in the same direction, the joint doesn’t feel anything, and to lengthen proprioceptors and turn on the system, one bone needs to move faster or slower than another. Often times, that cue cleans up the movement and the dissociation becomes more synchronous. Other times, the movement doesn’t improve, which leads me to check for restrictions in soft tissue, joint or both. Bringing awareness to something they client was previously unaware of, while also educating on the importance of creating parasympathetic responses that help to create neuroplastic changes, provides a vivid illustration of why learning a new movement and behavior is so important. Breathing must be a part of the process. As a metaphor, respiration is subconscious, but breathing is conscious. Therefore taking a breath while performing this new movement can allow for mind body integration, because concentration is on breath and movement. 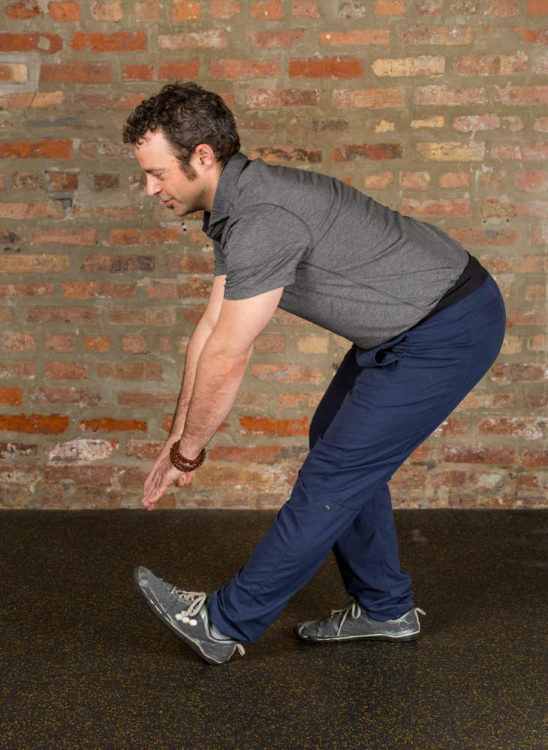 When we finally do begin to introduce a frontal plane lunge, I typically utilize the following progression, which has been an effective way for someone to learn this new and rather surprisingly complicated movement. The following is a description of the regressed to progressed movement patterns that I’ve found most beneficial for teaching. In conclusion, It is of paramount importance to find the threshold of the individual you are working with. While the progression above is general, it’s not individualized. Only through working with the person can a program be based on their wants and needs. The above sequence progresses from static to dynamic, and from stable to mobile, which are generalized guidelines. Clinically, the criteria I use for progressing movement is “How clean, fluid and rhythmical is the intended motion?” If it is fluid and clean, then I’m comfortable progressing the motion by adding a reach in space or a step in a particular vector; and conversely when the motion isn’t clean and fluid, it can be regressed by taking away a reach (or reaching less) or removing the step and making the same motion a weight shift. The beauty in understanding integrated human motion is that the motions at the joints are usually the same, regardless of if it’s a high-level or low-level person. What changes, based on the individual, is the speed, velocity and amplitude of the movement. Those are the variables used to influence a motion; how fast, how far and how much. Regardless, controlling the motion is the important component, and finding the neurological threshold is key to creating lasting changes because the body is governed by the nervous system. Improving Fascial Highways: Perspective on Integrated Motion & Motor Control. For more information on integrated movement, motor control, soft tissue and pain science, please reference the newly released book REAL Movement: Perspective on Integrated Motion & Motor Control, available on Amazon or at www.biomechanicaldetective.com. The book was designed as an adjunct to the course on movement I teach, Improving Fascial Highways: Perspective on Integrated Motion & Motor Control. Gray, G. Functional Video Digest Series. Vol 3.4 Functional Manual Reaction- The Foot and Ankle, Vol. 3.8 Proprioceptors. Barral, J. P., and Pierre Mercier. Visceral Manipulation.